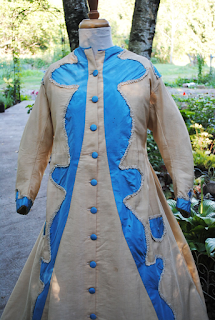 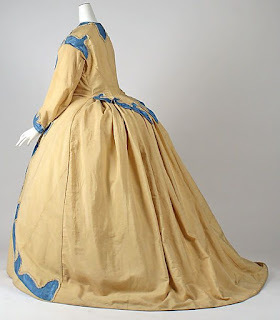 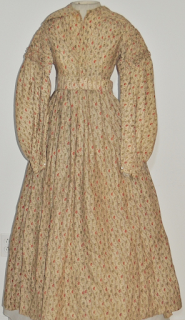 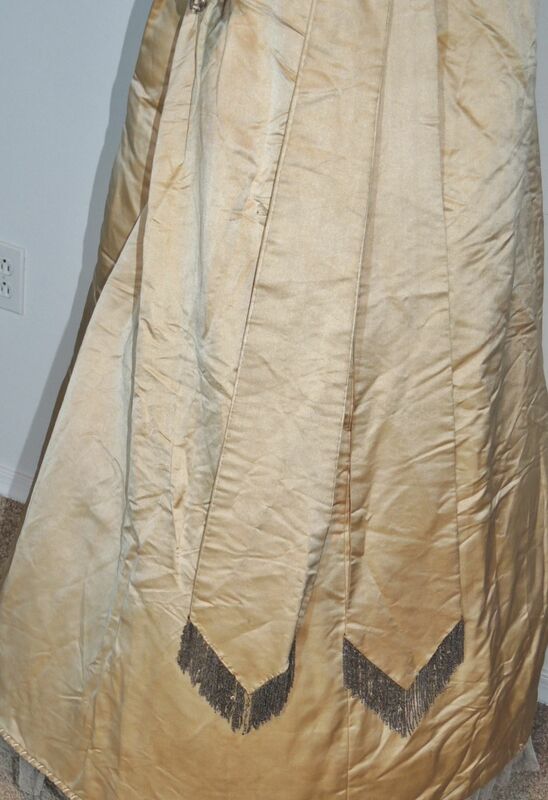 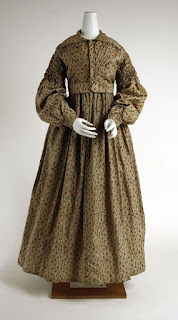 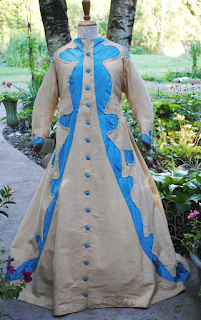 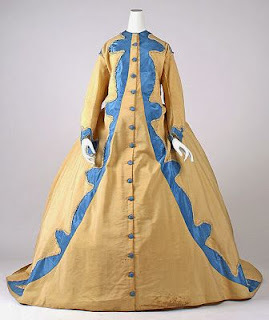 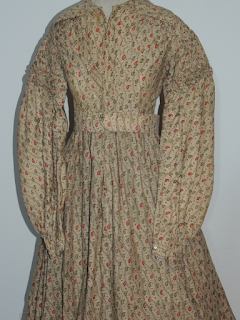 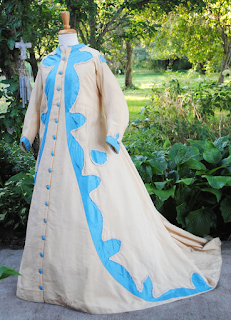 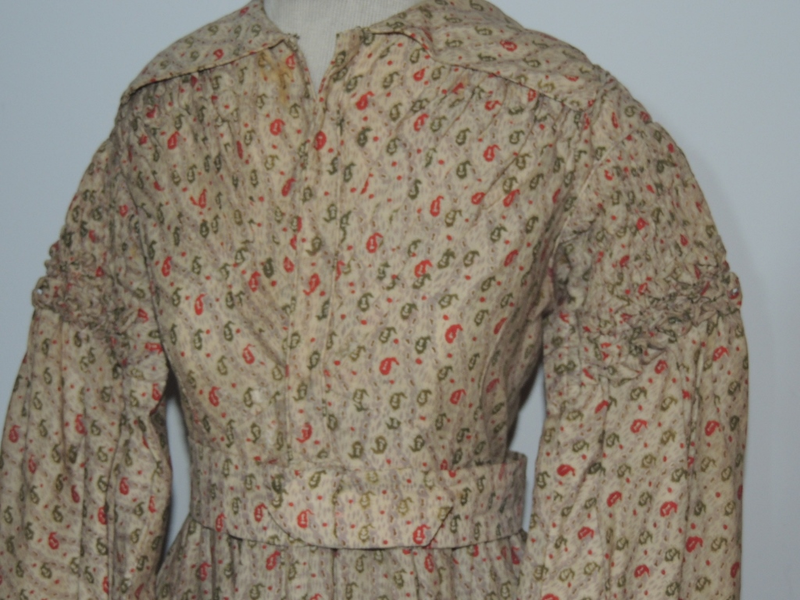 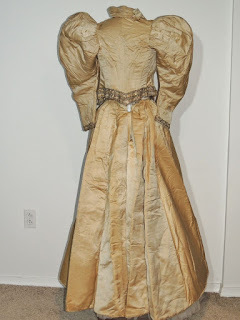 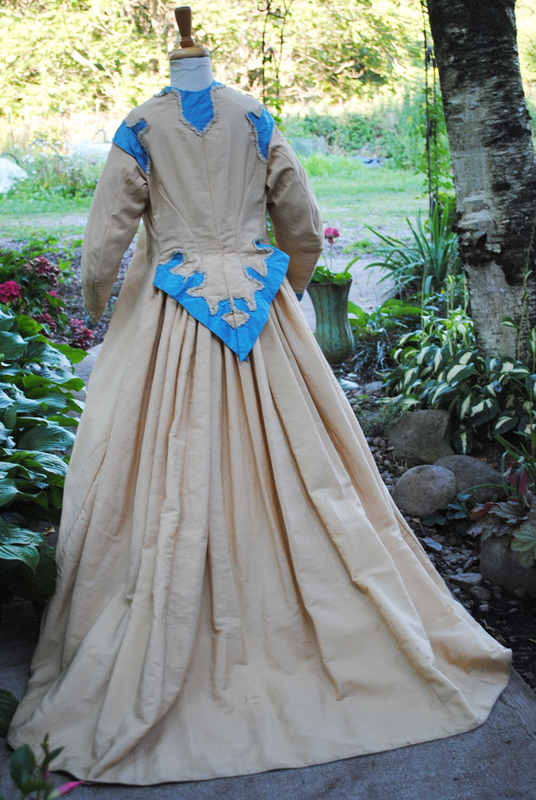 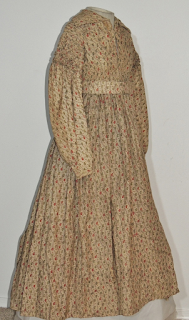 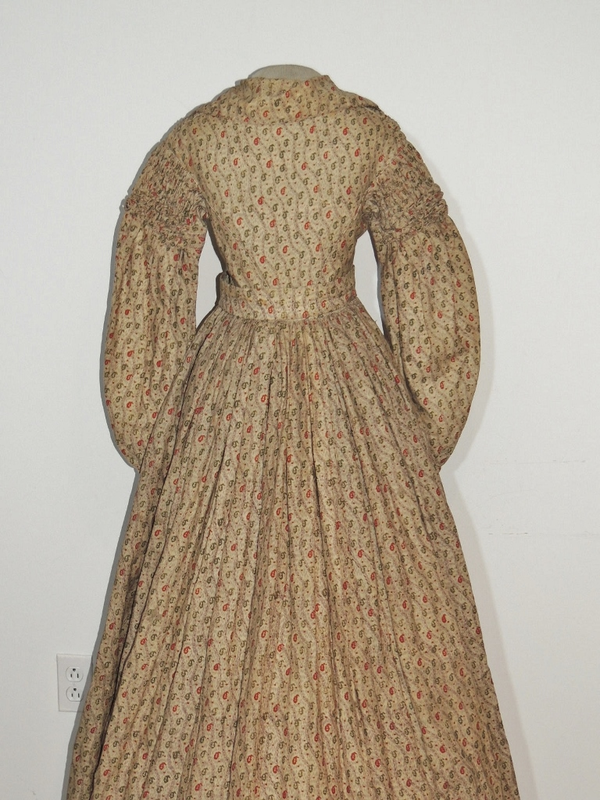 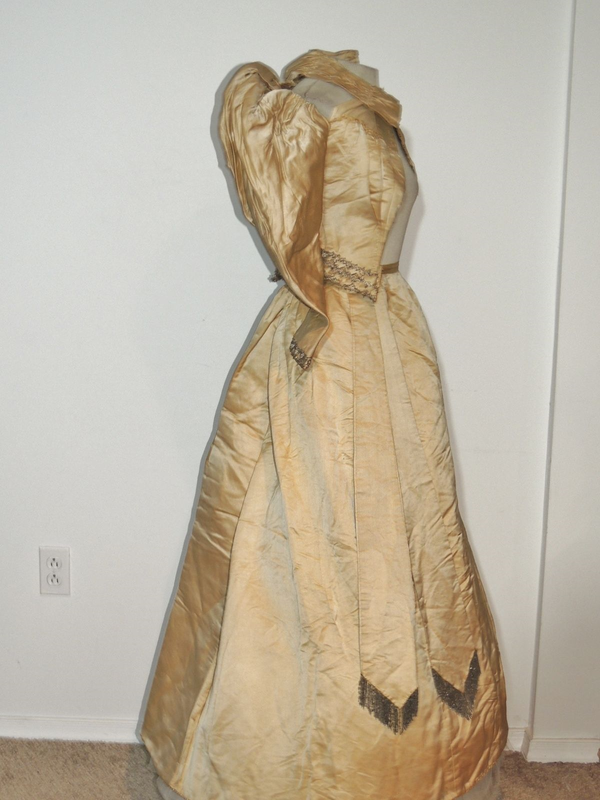 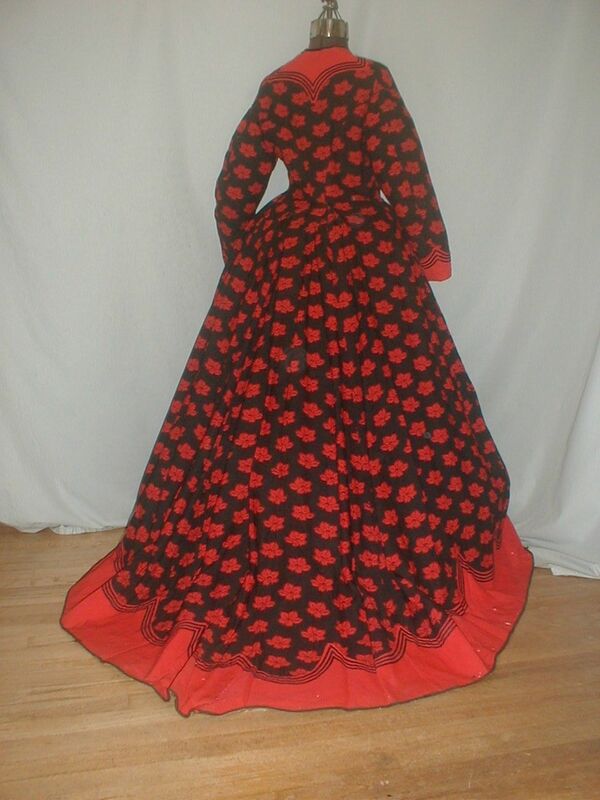 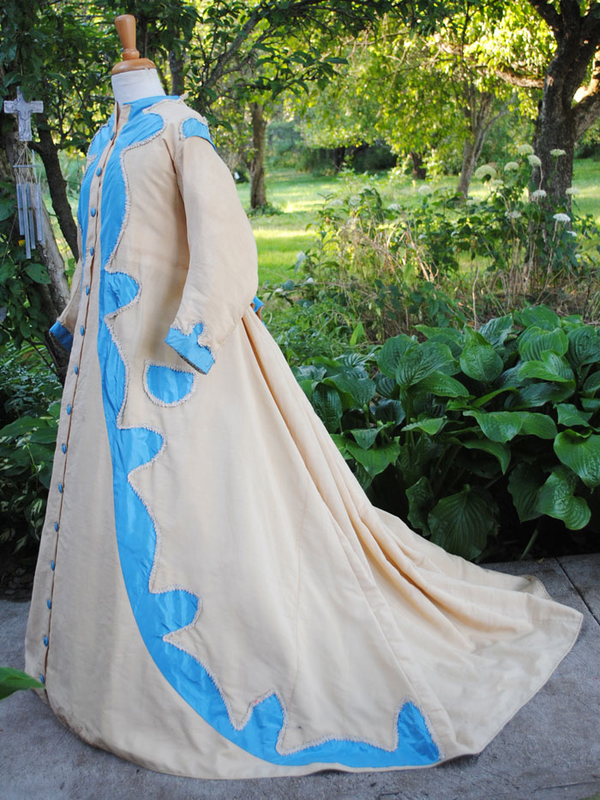 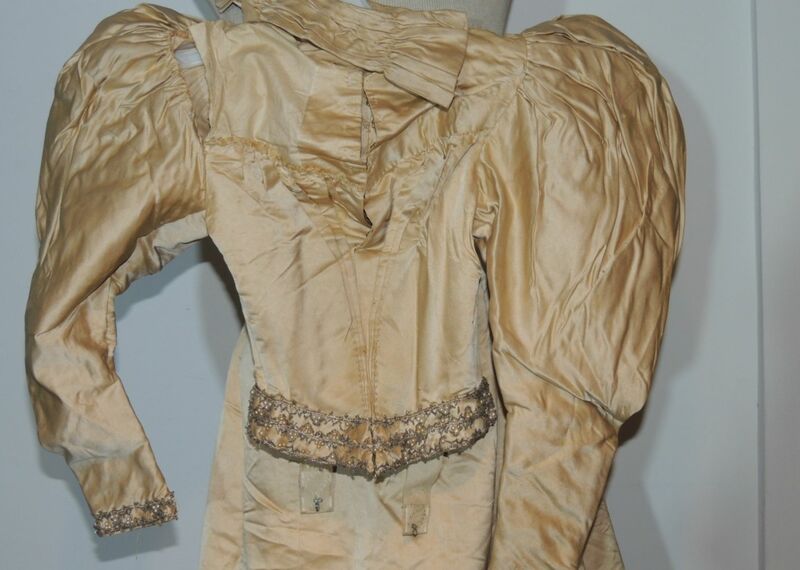 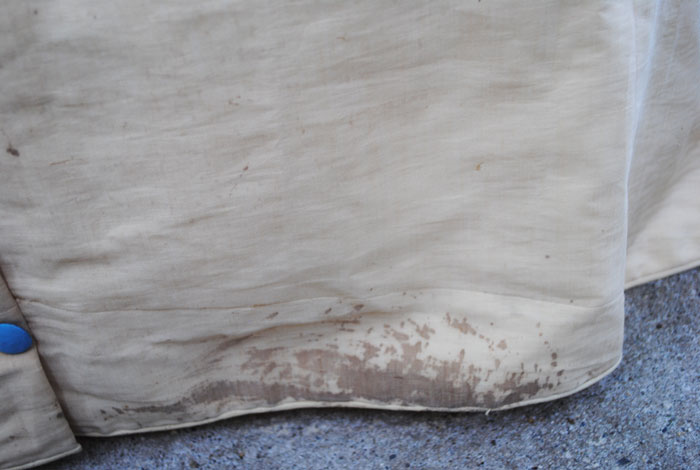 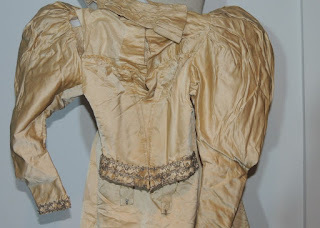 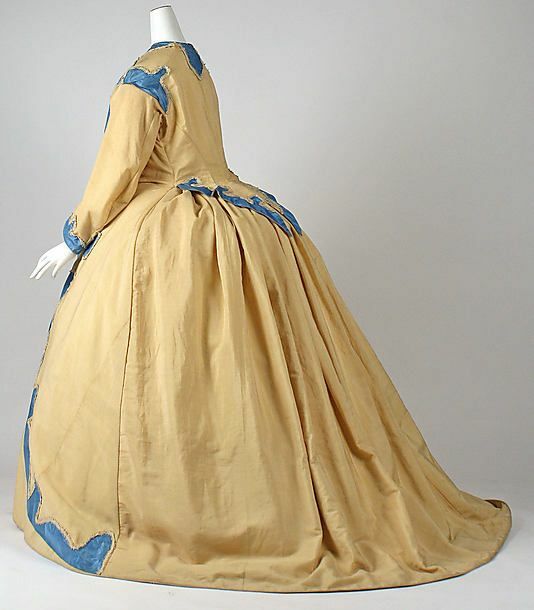 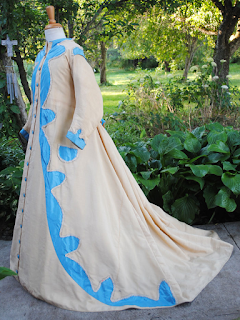 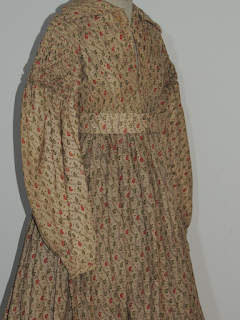 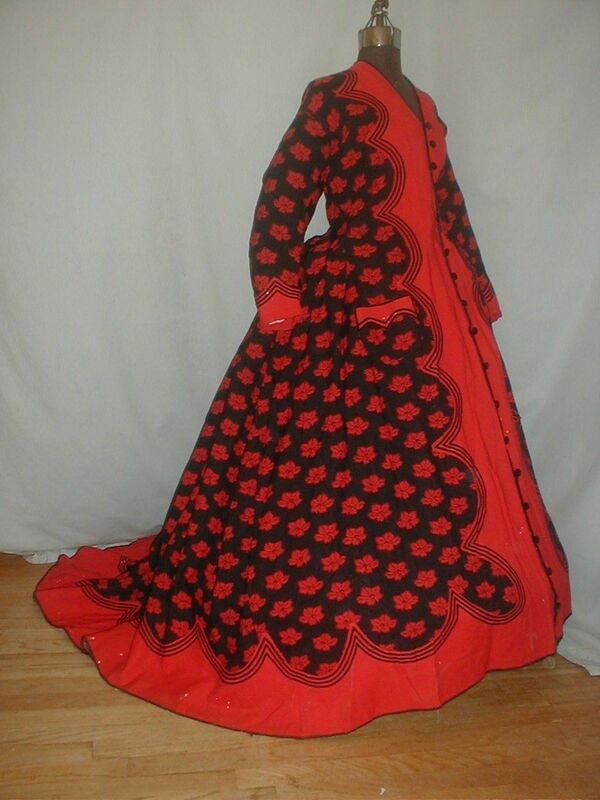 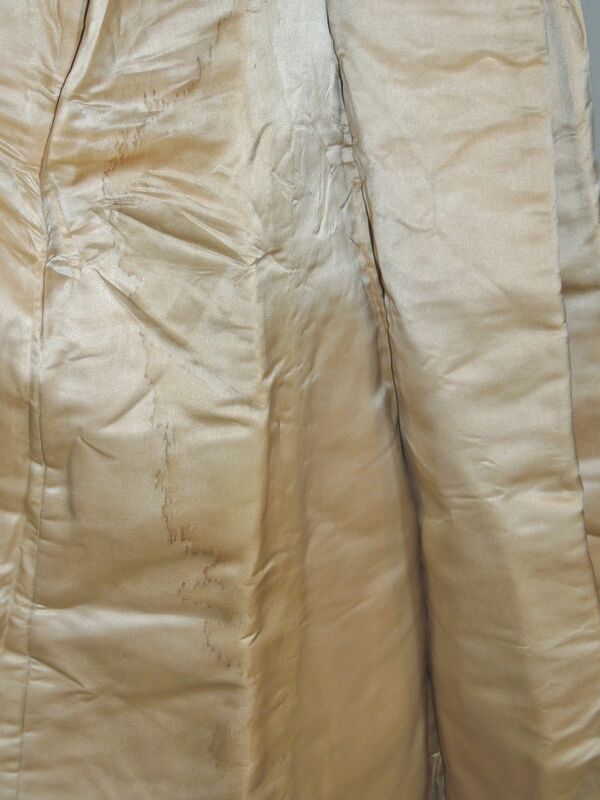 An antique original 1860 dress that has recently been found at a New England estate sale. 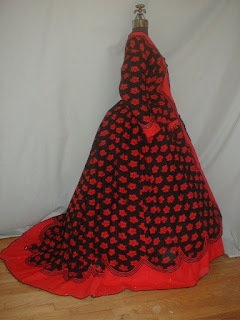 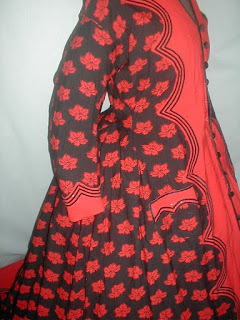 The dress is made of cashmere and has a large red leaf pattern on a black background. 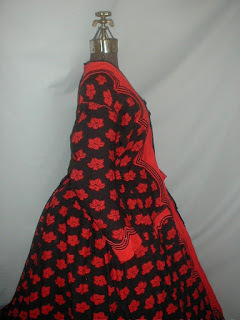 The neckline, front opening and hemline are made of red cashmere. 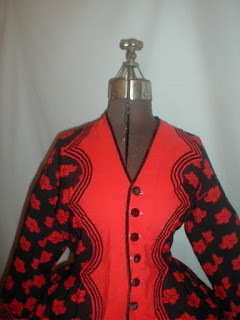 The front opening has black velvet piping and black velvet button closure. The skirt has a long back sweep. 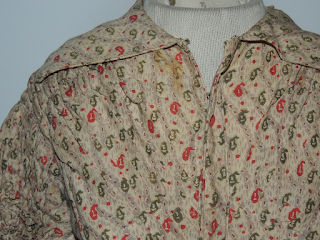 It is fully lined with cotton. The dress is in very good and sturdy condition. There are a few scattered moth nips, mostly to the back train. 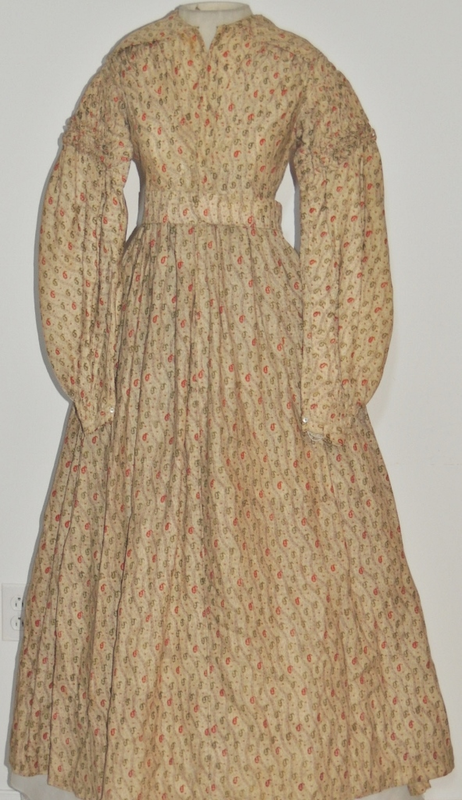 Bust 38 Loose fitting waist 30 Front skirt length 42 Back length 55. 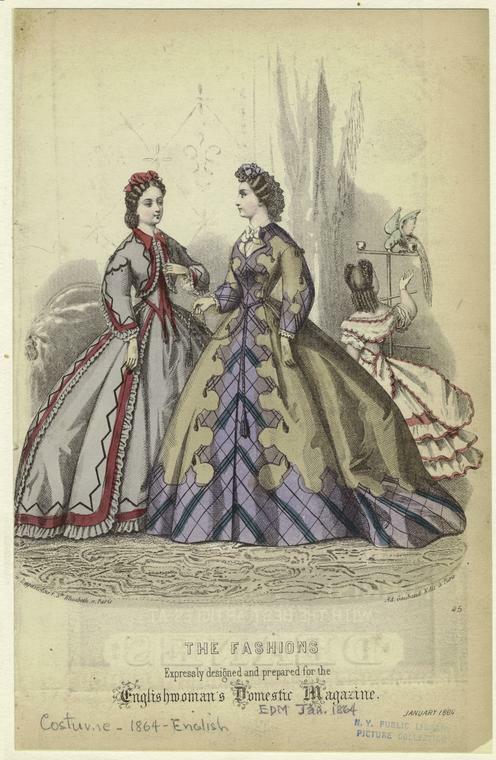 I love this wrapper if for no other reason that the use of colors. 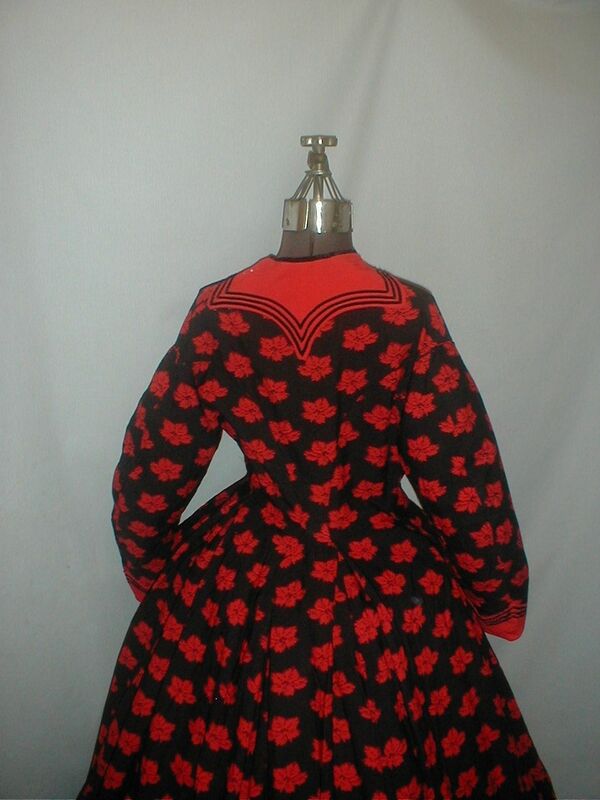 The print and the plain but vivid red border look perfect together. 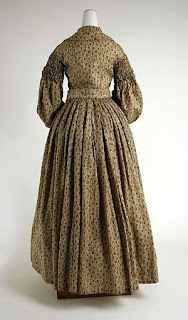 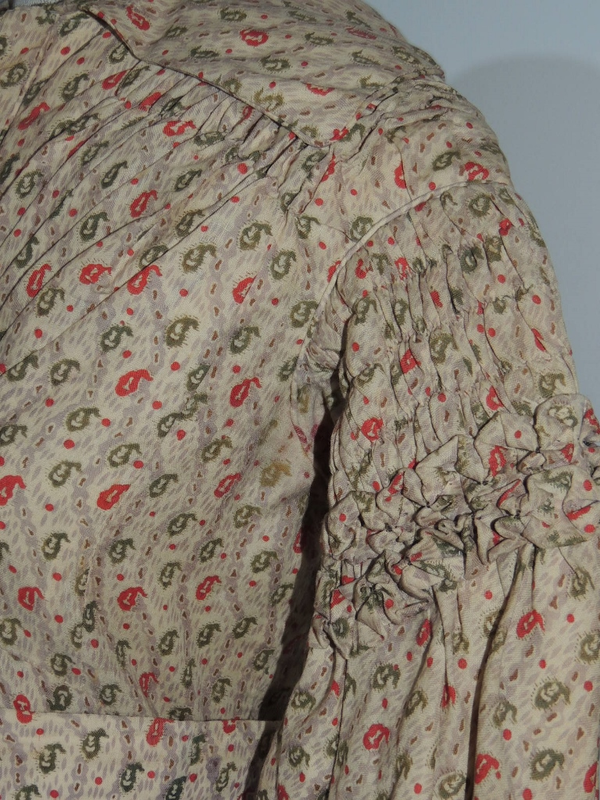 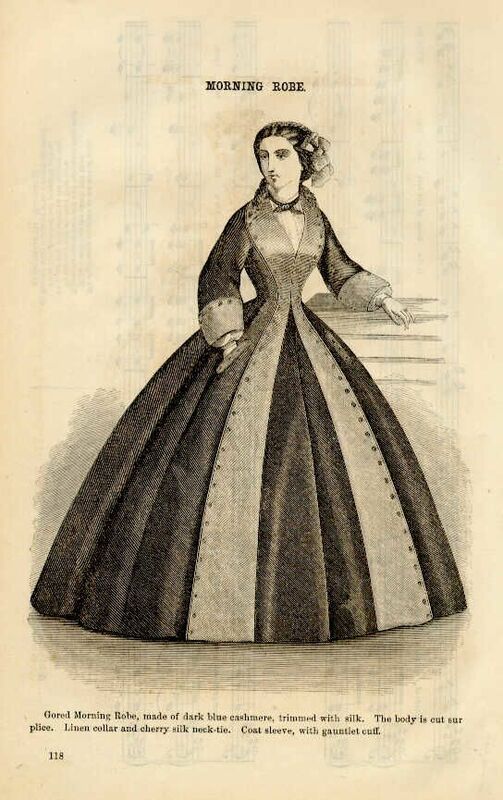 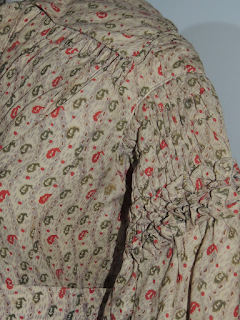 Although I think this particular wrapper/morning dress is from 1864/1865, I wanted to show the 1862 one for the neckline. 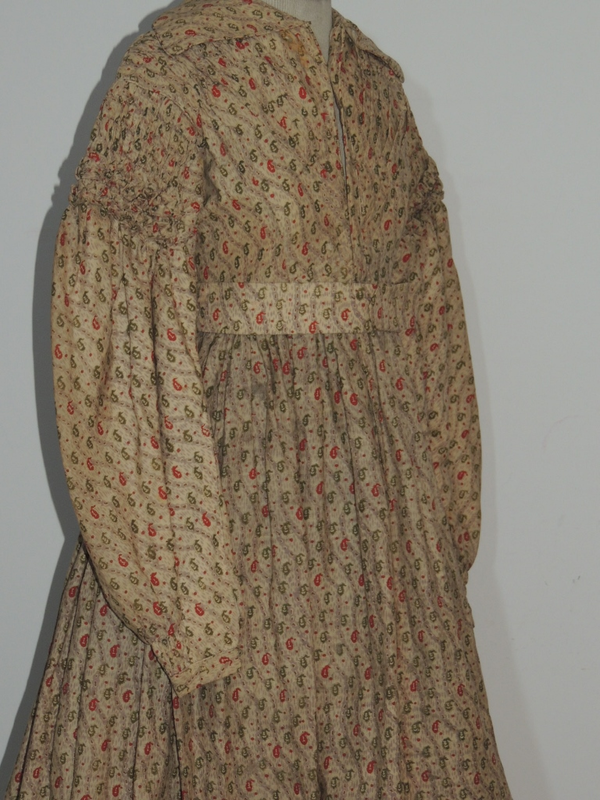 This printed dress is a light weight wool with a sylized boteh print in olive green and dark red on a cream background with a wavy taupe stripe. It has a slightly high waist with self belt, wide collar, front placket with a padded fan front bodice, ruched at the shoulder, upper sleeves and above the button cuff. IT has some thin sp;ots and a few minor tears, supported by a gauze lining, it has a stain on the front neck by the collar, hooks in front, missing some hooks/eyes. 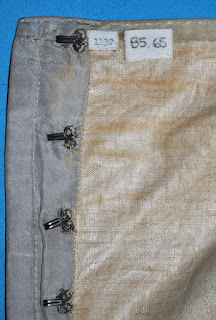 The lining has rust stains on the shoulders probably from a metal hanger, some small tears under the hooks/eyes, a little faded under the arms. It was from the Metropolitan Museum of Art NYC. Overall they called it in fair condition, I would call it good (I'm less picky and giving it a few points for age). 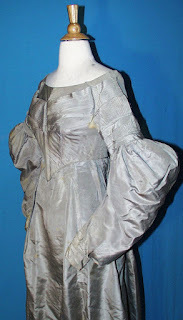 It's 32 inches around the bust, waist is 26 and it's 51 inches long. 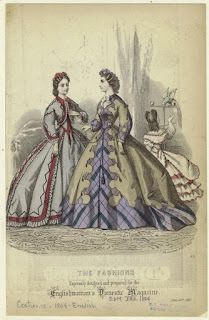 For some reason, the 1830's appear to be a mix of Dr. Seuss (just take a look at the hairstyles! 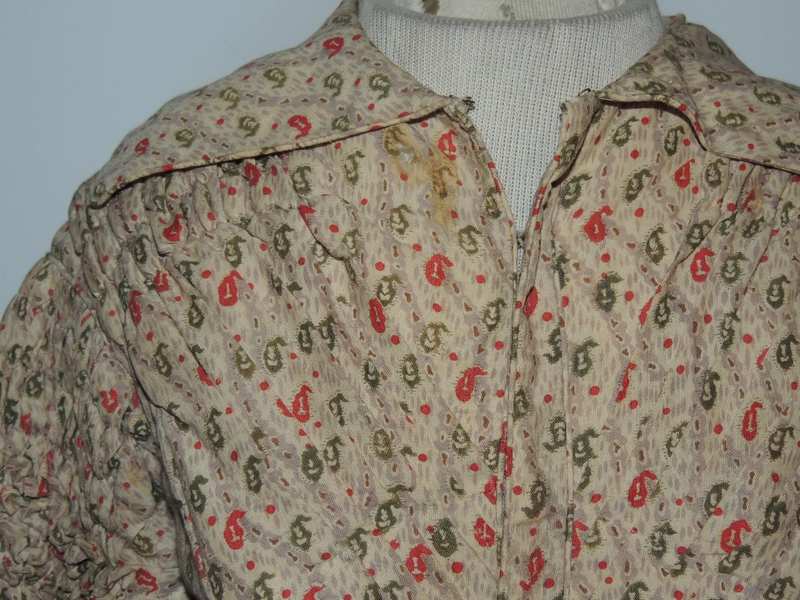 ), the 1970's (see the colors above? Tomato Red & Avocado Green), and Kate Greenway's illustrations and yet, despite all that, it somehow works. For a specific date, I believe it's more towards the 1837/1838 time period. 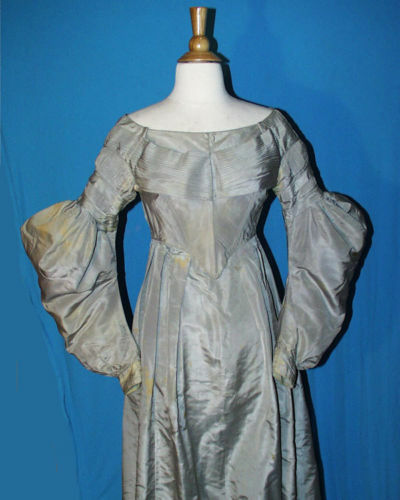 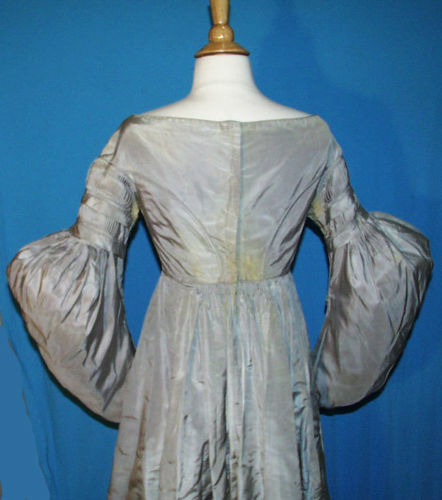 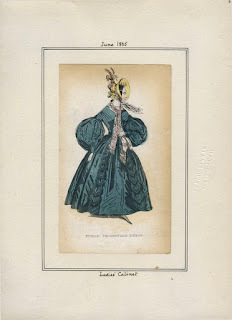 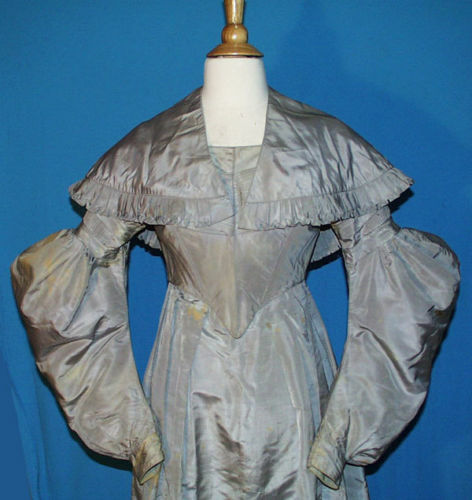 In 1833, they were still all about puffed sleeves of doom! Victorian ca 1870's Ivory Silk 2Pc Dress w Beading SM This beautiful Victorian dress is made from a very heavy silk satin. 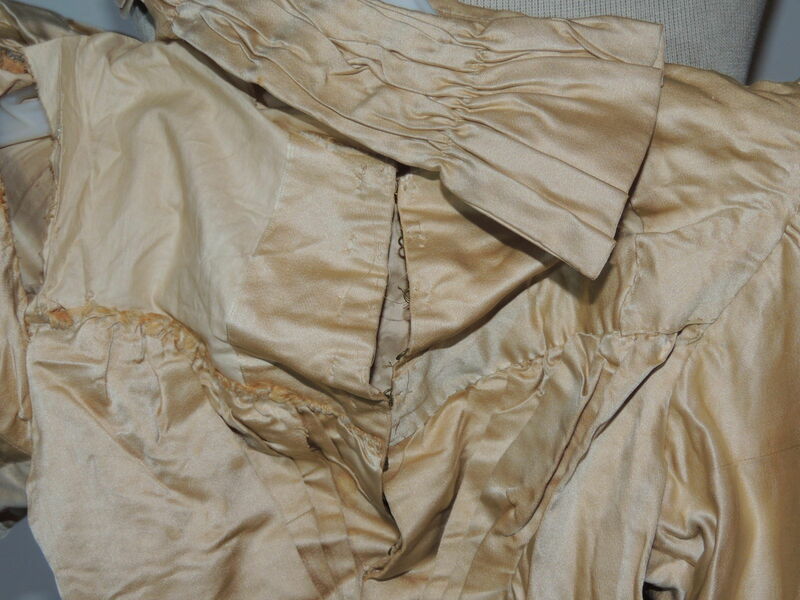 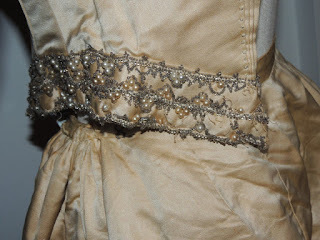 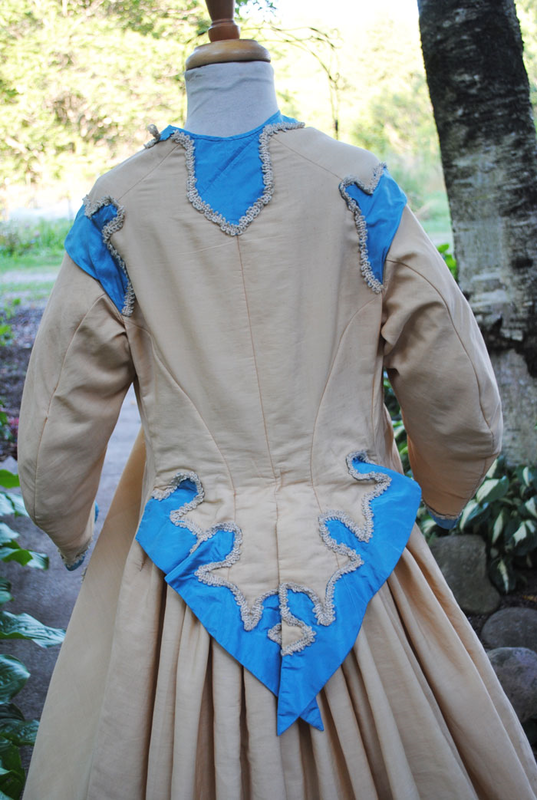 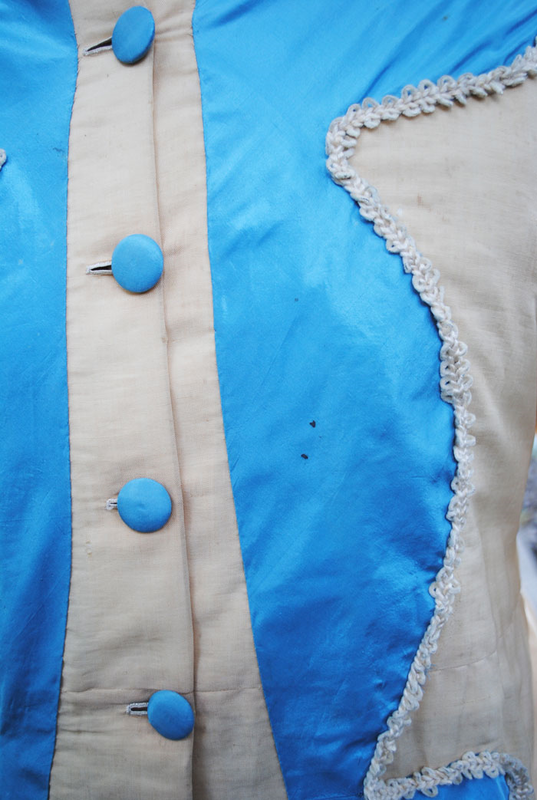 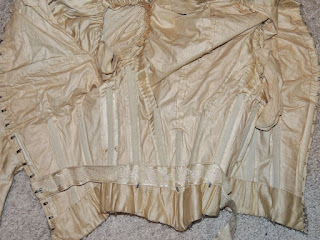 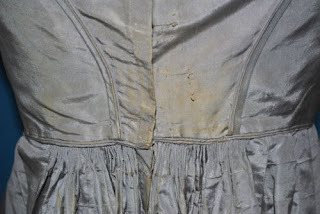 The bodice is lined with bones in the seams. 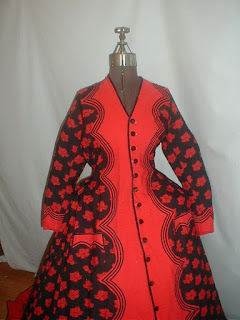 It hooks down the front an dhas wide beaded trim around the bottom and some on the edge of the sleeves. It has very gathered sleeves tapering to the wrist. 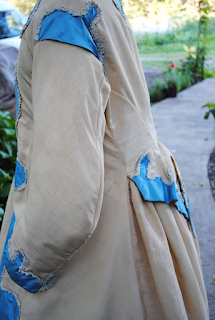 IT has opened seam on the shoulder, missing the trim / lace or silk on the front yoke, a few very small pin head to just over holes. 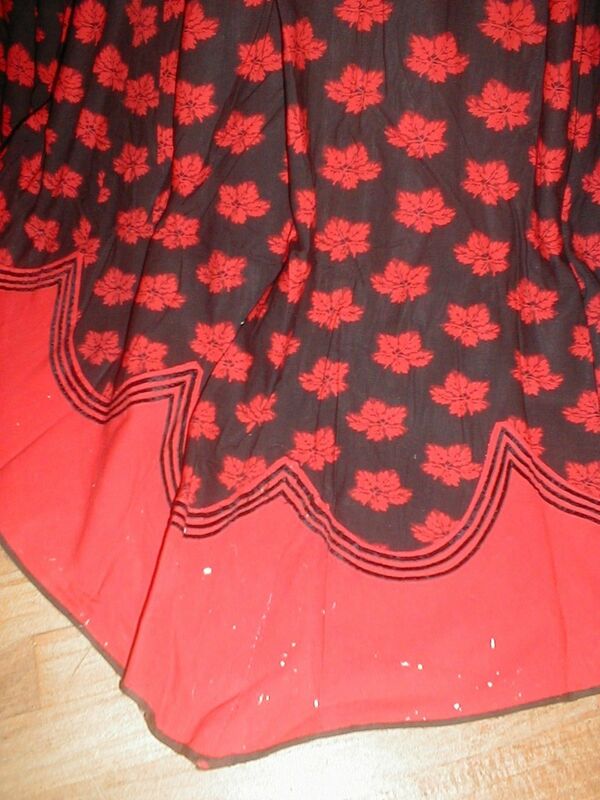 Both the skirt and the top have small scattered spots and is overall dusty looking, missing beads. 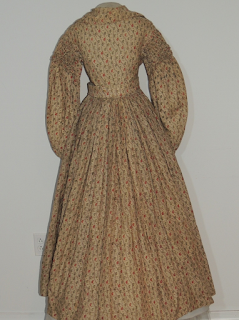 It measures 29 inches around the bust, waist is 20 1/2 and is 18 inches long from shoulder to center front point. The skirt has pretty cording around the bottom edge, it's lined in cotton and hooks at the waist. 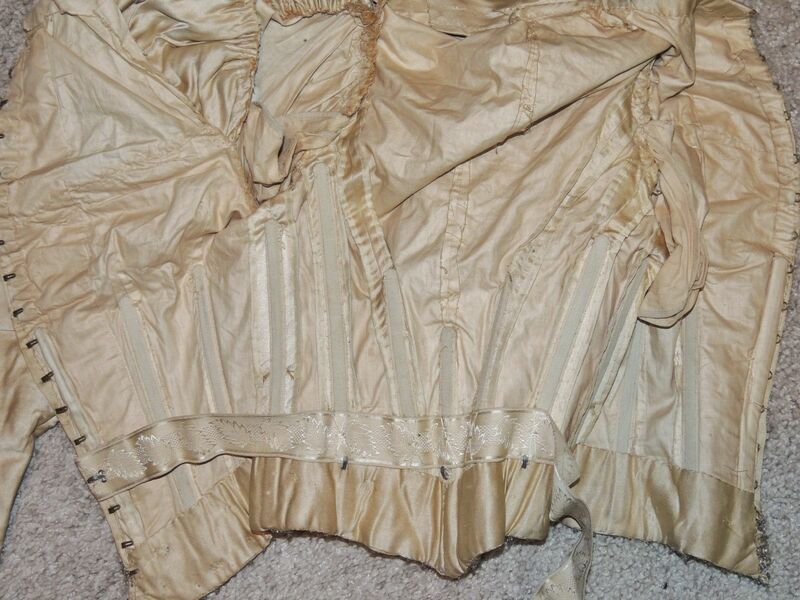 It's smooth in front and pleated in back, there's a ribbon across the back to hold the pleats in place underneath. A few very light, small spots and a few pin head holes, but there is a water spot on the back (photo), waistband has a few tears. There are 2 streamers with beaded fringe that are detached. 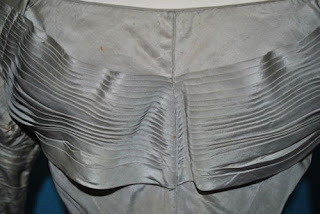 It measures 21 inches around the waist, hips full and it's 38 inches long. 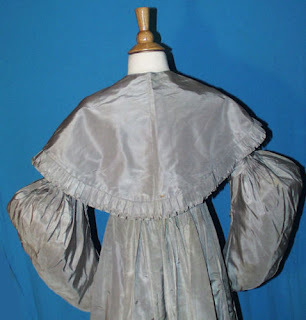 How anyone could mistake this for an 1870's bustle with those sleeves is beyond me. 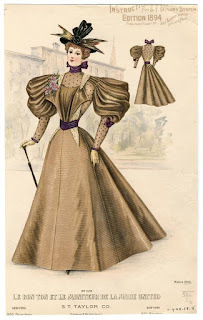 Clearly, this is mid 1890's. Given the measurements, to include the skirt being 38" long, I think this was for a teenager and not an adult.